Eighty-four people -- including several children -- died in the French city of Nice after a terrorist plowed a truck, which was "loaded with" grenades and other arms, into a large crowd during Bastille Day celebrations Thursday night, according to officials and the French president. As of Friday 8 a.m. local time, 18 individuals were in critical condition, 50 were lightly injured, and 120 were receiving treatment, according to a spokesman for the Ministry of the Interior. Prior to the announcement Friday morning that 84 had died, the death toll had been 80. 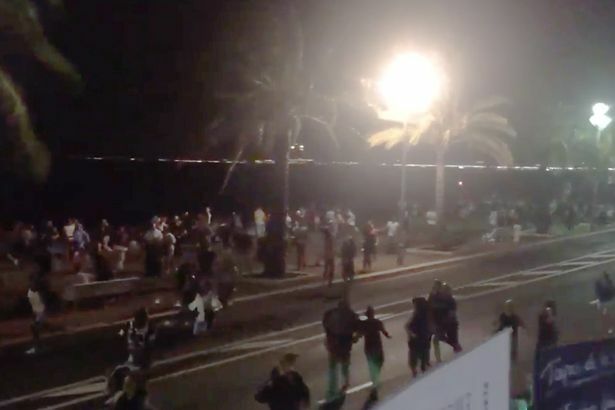 The attack left an "apocalyptic" scene, according to eyewitnesses, on the city's famed Promenade des Anglais, which runs along the Mediterranean Sea. The French Riviera city was subsequently put on lockdown. The exact nature of the attack was unclear, but the Paris anti-terrorism prosecutor's office was put in charge of the investigation. French President Francois Hollande extended the country's state of emergency for three months and were mobilizing reservists. He said it was unclear if the attacker had any accomplices. Hollande also discussed the threat of "Islamist terrorism." “The terrorist nature of this attack cannot be denied,” he said. "France is horrified by what has just occurred - a monstrous act of using a truck to intentionally kill dozens of people celebrating 14th of July," Hollande said. "France is strong. France will always be stronger than the fanatics who want to strike France today." World leaders were quick to condemn the deadly attack. President Obama said in a statement, "On behalf of the American people, I condemn in the strongest terms what appears to be a horrific terrorist attack in Nice, France, which killed and wounded dozens of innocent citizens. Our thoughts and prayers are with the families and other loved ones of those killed, and we wish a full recovery for the many wounded." The State Department tweeted, "US Citizens in #France: Avoid area near attack in Nice. Monitor local press for updates & exercise caution." Canadian prime minister Justin Trudeau tweeted, "Canadians are shocked by tonight's attack in Nice. Our sympathy is with the victims, and our solidarity with the French people." Chinese premier Li Keqiang said, "We strongly condemn terrorism of all forms. We express our condolences to the victims and we will fight all kinds of terrorism." European Council president Donald Tusk said the world stands united with the French people. "It is a tragic paradox that the victims of the attack people celebrating liberty, quality and fraternity," he said. "We will stand united with the families of victims, the French people and the government in the fight against violence and hatred." Julie Bishop, Australia's foreign minister, said three Australians suffered minor injuries while fleeing the scene. "It has shocked France, it has rocked it to its core," she said, adding that the attack was particularly symbolic, because it occurred on Bastille Day. "This should have been a time of great national pride and celebration." Hollande also slammed the attack on the national holiday. "France was struck on the day of its National Day, the 14 of July, a symbol of freedom, liberty, human rights denied by these fanatics -- and France is obviously their target," he said. "I would like to express on behalf of the nation our solidarity with the victims and with their families. All resources, all our means are being deployed in order to help the injured." Christian Estrosi, president of the Nice region, told French TV that the motorist "fired on the crowd, according to the police who killed him" and said that "the truck was loaded with arms, loaded with grenades." The truck was driven by someone who appeared to have "completely premeditated behavior," Estrosi said, adding that the attacker appears to "have used, while ramming his vehicle, a firearm through the window." French Interior Minister Bernard Cazaneuve said all demonstrations will be banned in Nice over the next few days. Jimmy Ghazal, 39, a Lebanese man visiting Nice with his family, told ABC News that after the fireworks concluded, he heard people screaming and heard what sounded like gunshots. He saw people run to shelter. Video showed crowds of screaming people running through the streets in panic. Kerry said in a statement, "Today's horrendous attack in Nice is an attack against innocent people on a day that celebrates Liberty, Equality, and Fraternity. "On behalf of all Americans, and especially the great many with close ties to France, I offer our deepest condolences to the friends and family of those who were killed and our hopes for a speedy recovery to those who were injured. "I was proud to stand alongside French leaders earlier today at Bastille Day celebrations in Paris, and the United States will continue to stand firmly with the French people during this time of tragedy. We will provide whatever support is needed." Earlier Thursday, French President Francois Hollande had said France’s state of emergency -- which has been in place since the Paris terror attacks in November -- would be lifted later this month.